There is something hilarious, bold, and humbly ironic in taking what should have been an epic battle and delivering a three-second death scene instead. All the hemming and hawing over Maul’s power and influence, through The Phantom Menace, a large number of The Clone Wars episodes, and a good chunk of this season, is literally cut down in mere moments. It’s a literal and figurative cosmic joke. Maul was a nobody, pursuing nothing, and had no chance at victory, both because Kenobi was a wiser, better fighter, but also because we all know Maul had no real impact on the Star Wars Story(tm). In the end, what was really the point of Maul? There’s an intergalactic rebellion going on, and we’re spending all this time on this one dude’s petty revenge-fest? The cold opening of “Twin Suns” was really the key. Maul’s faux-Shakespearean speech, all bombast and melodrama, took place in the middle of a desert wasteland, with no one around to hear–or care. So of course he called for the only person in the galaxy who would care. This was the core lesson that Ezra had to learn. “Twin Suns” plays with our expectations. We were expecting the ultimate, final battle between Kenobi and Maul. What we get is a very narrow, very specific story where we follow Ezra on yet another self-guided, self-indulgent excursion. He thinks he knows better. He just knows that Maul is out there, and they have to stop him, because he’s after the one person who can help them all, right? Of course, we know better. We know Ezra is being his usual stubborn self–in a season filled with moments of Ezra screwing up–but we also know that the work the rebellion is doing is hard, tedious, and brutal, and no “Chosen One” will counter or prevent that. Hera tries to get that through this thick skull. It looks like it takes–but of course it doesn’t. Once again, Ezra is off on his own, stealing a ship and blasting right off to Tatoonie. You can hear the audience rolling its eyes and sighing at this latest trip. But this time, writers Dave Filoni and Henry Gilroy are right there with you. So we watch him get lost in space, following the Holocron’s signal as Chopper plays the helpless companion/chaperon. Immediately upon landing they’re attacked, and in the chaos their ship is destroyed (in a rebellion that’s desperate for supplies and weapons, even a single lost ship is devastating). Trapped in the middle of nowhere, Ezra and Chopper head off to take shelter, until that call sends Ezra off into the desert, Chopper reluctantly following (I love this bit: Ezra already learned that it’s all a trap, but he still treks off like an idiot). Ezra is so sure of himself–through sandstorm and blazing heat–but nothing comes. And when Chopper’s gears finally get filled with sand–his only compatriot frozen, figuratively “dead”–Ezra finally realizes he made a costly mistake. Director Dave Filoni doesn’t push himself too much here, but he definitely utilizes sharp edits and striking shots to get into Ezra’s desperation, confusion, and sense of loss: extreme close-ups are followed by isolated wide shots; noisy, busy scenes cut to pure nothingness. “Twin Suns” is not a full character study of the teenager, but a small observation of one boy’s rash (if well-meaning) decision, and the full consequences of it, with no distracting “Force spirits” to guide him. That final point is revealing, I think. The Holocrons that spoke to Ezra were just Maul’s voice, and even as he meets Obi-Wan–who saved him from dying out in that desert–there’s no spiritual apparition here. It’s just the calm, collected, wise voice from one former Jedi telling Ezra that his role is elsewhere, that there are those who need you, now. Ezra has been relying too much on his abilities and his Force connections (which contributed to his overall cockiness), and that it almost got him, and others, killed. 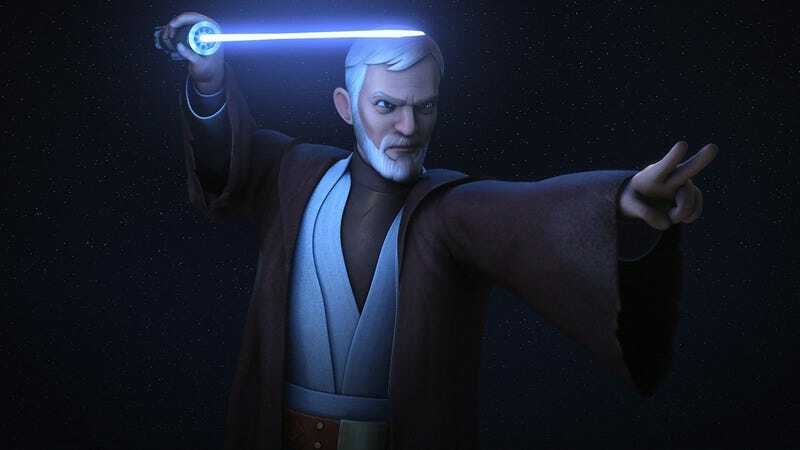 Now he can focus on the real battle ahead, the upcoming battle for Lothal and his home, and desist that Jedi search for easy, instant winning moves. Which is ironic, especially when Obi-Wan and Maul face off: The Good, The Bad, and The Ugly standoff is followed by a laughably easy victory. The Maul arc is over, but really, should it have even began? Star Wars Rebels is winking here, but beyond that, the show is making a statement. “Twin Suns” might be a divisive episode, but it, along with the past few episodes, suggest Star Wars Rebels is not only becoming a genuinely good Star Wars show, but a good television show, with characters making hard decisions (Sabine’s departure), with moments of striking weirdness (AP-5’s song cues), and metatextual narratives both bold and ironic (Maul’s non-existent revenge). He’s too a wild season finale next week. I have no idea why Ezra never used his lightsaber when he was being attacked by those Tusken Raiders. I thought he just didn’t bring it, but then suddenly he whips it out in the desert. That was inexplicable and kinda hurt the episode a bit. 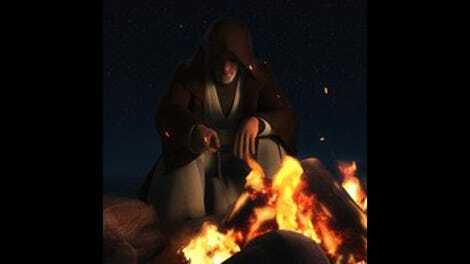 Two other things that bothered me: I wish that Ezra was punished or scolded more for his actions when he got back to the base (he’s been getting away with far too much), and I could have done without that final scene of Obi-Wan gazing at Luke’s home. It’s a final visual scene that laid too much meaning on yet another reference to A New Hope and took away from Ezra’s overall journey here. Speaking of which: this is a stretch, but Ezra’s travels felt partly like a biblical allegory, which him wandering in the desert tempted by Maul as a devil-like temptress. It recalls Jesus’ time as he fasted in the desert while the devil kept tempting him, although the reference wasn’t one-to-one. All the better for it, I think. “[Maul] led you here, where you should never have been.” Probably the most winking reference to the show’s own frustration with forcing the Ghost crew into meeting with the more famous Star Wars characters? “He will avenge us.” This feels like a desperate Maul line, since his vengeance was towards Obi-Wan, although I can see it meaning the Empire as a whole. I think it would’ve stuck more if, overall, Maul had indicted some hatred towards the Empire as well. He barely did.